The footer area at the bottom of your weblog posts can be a great way to provide more content for your readers. A lot of information can be included in the post footer, including the Author Nickname and links to popular social bookmarking services like del.icio.us and Digg. At Weblogs > Design > Select Content, you can select the content you want included in your post footer. Options include providing links to the index pages for categories assigned to the post, showing the date and/or time the post was published, and displaying the Author Name. This allows your readers to learn more about the post. If you have a blog with blog multiple Guest Authors, you may want to include the Author Name in the post footer to show who composed each post. The Author Name displayed will be the full name included in the Author Profile, unless you have a Nickname designated. Enter a Nickname at Control Panel > Profile to prevent your full name from being included in search engines or to remain anonymous. Or maybe you want to point your readers to further resources related to your post. From the Edit Post Page, you can enter Technorati Tags that connect your blog to Technorati and include your post in search results with other posts using the same tags. 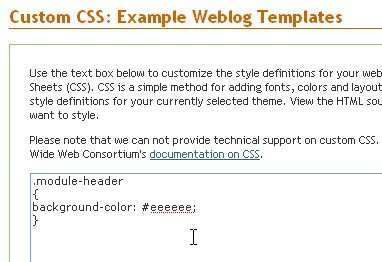 We also have tips for how you can use Custom CSS to style of the tags displayed on your blog in our Knowledge Base. Another popular option is connecting your blog to FeedBurner, which allows you to add FeedFlares to both your blog and feed. These options make it easy for readers to share and promote your posts. 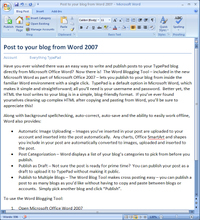 For example, TypePad's Featured Blogs includes links to email the post, bookmark with del.icio.us, and subscribe to the feed, all using FeedFlares. FeedBurner has a vast catalog of available FeedFlares that can be added, including AddThis, email author, and view Creative Commons license. You can also create your own using the FeedBurner API. Still hungry for more? With Advanced Templates, Pro level users can further customize the post footer by editing the <$MTEntryPostFooter$> tag as described in our Knowledge Base. Editing the MTEntryPostFooter tag allows you to customize the default text, like "Posted by" and "Comments", or remove the Permalink. A few weeks ago we explained that the knowledge base is not just for new users and we mentioned Custom CSS. We want to share more about this feature with you now. While that big empty box may not look like it can do a whole lot, looks are very deceiving. This Pro level feature is a great way to customize your weblog's appearance without converting to Advanced Templates. With a little CSS know-how, you can be on your way to perking up your weblog in no time. We have shown you how to center a banner in a fluid theme and how to add a banner to a pre-defined theme but how about we show you a few more tricks? Our knowledge base is always being updated to contain new information and we've added a few tips and tricks like how to add a background image to your weblog and removing padding from a banner as well. The key to using this feature successfully is to view your weblog's source code, determine what class is applied to the item you want to modify and add in the CSS to make the change. Not experienced with CSS? That's okay, this great tutorial can help get you started. As you start making your first few modifications to your weblog, you will begin to discover that the possibilities are endless. Put Your Blog to Work! There are several ways you can make money with your TypePad weblog, simply by doing what you love – blogging. If you have any products that you would like to sell - be it jewelry, crafts, photographs, or anything else – you can use PayPal or some of our widgets to add shopping links to your weblog. We have instructions on how to do this in our Knowledge Base. By now, it seems that most everyone has made at least one purchase from Amazon. If you are an Amazon Associate you can take advantage of the program by entering your Amazon Associates ID into your author profile. Then, any time you enter an item from Amazon into a Reading or Music TypeList, your affiliate link will automatically be used, earning you money from sales. We also have some Amazon Widgets that you can add to your weblog that work with your Amazon affiliate ID. You can recommend products, allow people to search Amazon directly from your weblog, and use simple HTML to link to products in your blog posts. 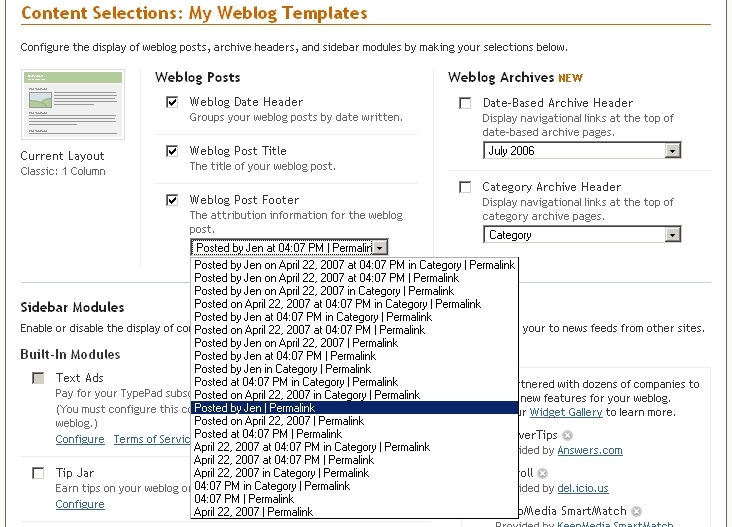 There is additional information on how to use these widgets with your weblog in the Knowledge Base here. All subscribers are able to add their own advertising to their weblogs. We have step-by-step instructions for adding Google AdSense ads, one of the most popular types of advertising, to your weblog. Most other advertising items of this nature can be added with a Notes TypeList. A couple affiliates that supply ads that are easy to place on your site with a Notes TypeList are Blogads and AdBrite. Finally, you can also make money by spreading the word about how wonderful TypePad is by becoming an affiliate through Commission Junction. Simply refer people to any of our products – TypePad, Movable Type, or LiveJournal – and you’ll earn money just for letting your readers know how much you love Six Apart. Most subscribers are familiar with TypePad's built-in rich text editor as a way of posting to their weblogs, but it's not the only way to compose posts. Here are a few other methods of adding punch to your text. If you prefer to compose your posts offline, or are looking for a different environment for composing posts, you might want to try out a desktop client. Desktop clients offer an alternate way to compose your posts. Some clients are free, like Windows Live Writer (great for PC users who love the functionality of Word, but hate the formatting that copying and pasting causes). Others, like Ecto, include support for Markdown, which is discussed below, and are available for both PCs and Macs. 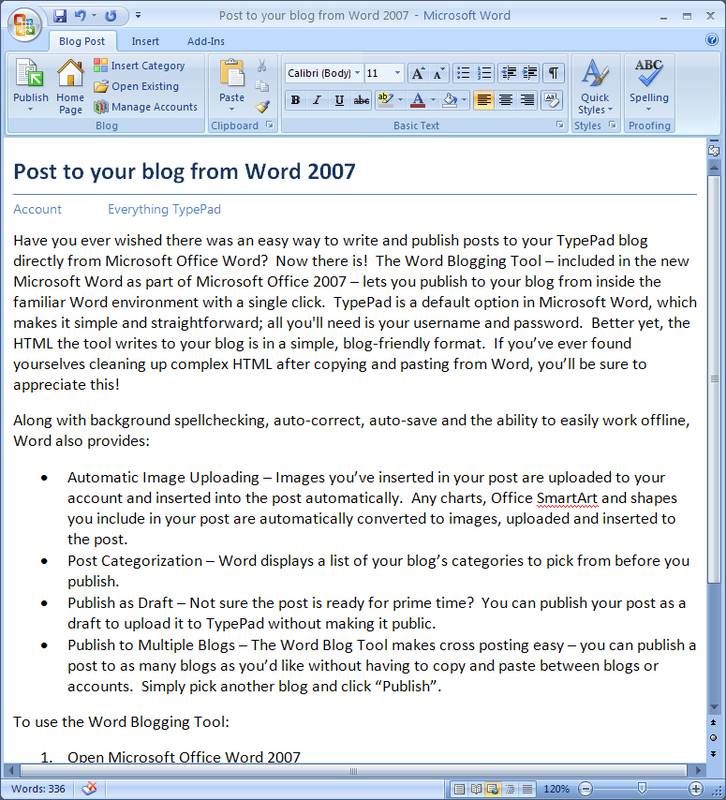 And in case you missed our recent post, if you've already upgraded to Office 2007, you can even post to your TypePad weblog right from Microsoft Word. 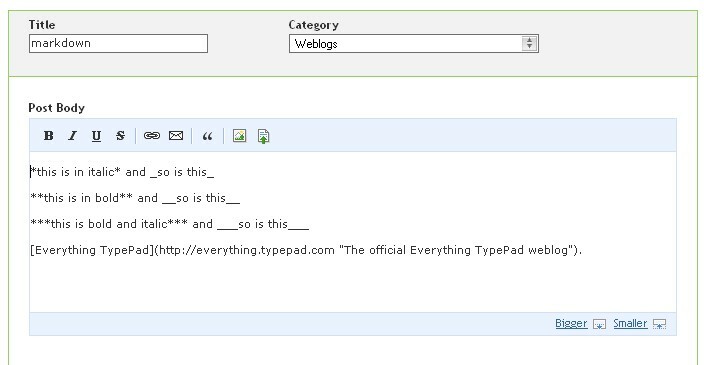 Or maybe you want to compose your posts in TypePad but are looking for an easy way to add formatting. Though you may not be familiar with Markdown yet, it's a recent addition to TypePad that you just might love. Markdown is a formatting option that transforms your readable, plain text posts into error free HTML - without you needing to use code or click buttons. Since Markdown uses syntax that makes sense in either Plain Text or Rich Text format, it's easy to learn, and easier to use. If you'd like to try using Markdown in your posts, we have more information in our Markdown Knowledge Base article. The syntax used for Markdown can be found here. The previously scheduled maintenance has been postponed. We will post again when the maintenance has been rescheduled. We apologize for any inconvenience. Wednesday, April 11th, starting at 9:00 pm PDT, we'll be taking TypePad blogs offline for approximately two hours to perform routine maintenance. During this time, the TypePad service will be available, but blogs will be down.